On the first day of the 1968 All England Championships at Wimbledon, Rod Laver headed to the grounds dressed for the occasion—complete with his well-preserved purple and green Wimbledon tie. Laver was returning to the home of tennis after six years, not as an ostracized pro but as a two-time champion and top seed. That English summer, 50 years ago, marked the first time that The Championships would be truly “open". Professionals would now compete with amateurs on equal terms. Most of the big tournaments, including the four majors, did not allow professionals—those who earned money from the sport—to enter till 1967. Australia’s Laver, who won his first calendar Grand Slam in 1962, had to forgo competing at the majors once he turned pro in 1963. But with the wall dividing the two sects coming down in 1968, Laver and fellow pros like Ken Rosewall and Pancho Gonzales were welcomed as heroes. “There was palpable excitement in the air at the All England Club, Wimbledon, that year despite the incessant drizzle and a rail strike that kept many fans away," the “Rockhampton Rocket" wrote in Rod Laver: An Autobiography. “The more progressive elements in the British tennis establishment had been instrumental in establishing Open tennis, and now amateurs and pros were rubbing shoulders on Wimbledon’s historic courts. It was an amnesty ceremony as much as a tennis tournament." Time seems to stand still in the quaint, green surroundings of Wimbledon where tradition is honoured and cherished above everything else. Yet, it was the unlikely site of the biggest revolution in tennis. The end of the 1960s saw social and political upheaval across the globe. From the Prague Spring, the Movement for the Liberation of Women and protests against US involvement in the Vietnam War to the Civil Rights and Black Power Movements, people across the world were crying out for change. In keeping with the spirit of the times—and true to the non-violent Flower Power ideology—tennis’ rebellion came in a boardroom. Tired of the under-the-table deals made by tournaments to ensure the participation of the best amateur players of the era—“shamateurism", as it was called at the time—the British Lawn Tennis Association voted overwhelmingly in favour of “open" tennis in December 1967. The chairman of the All England Club, Herman David, believed amateurism in tennis had become a “living lie". “Amateur" is derived from the Latin word amare, which means “to love". While the ideal existed when tennis was born in Victorian England, mainly as the pastime of the elite, it had become a tiresome bone of contention for the tennis world. Since 1926, established, mainly older players had turned tennis professionals to benefit from their talent. The earliest success story was the big American Bill Tilden, who turned to the pro tour in 1930 after winning seven US Open and three Wimbledon titles. It was a tough life, with players touring the US or Europe for one-night exhibitions on makeshift courts in warehouses, music halls and even ice rinks. The professional tour came to have its own majors, the Pro Slams, like the Wembley Pro or US Pro. They attracted the biggest names and the best talent. In 1947, when Jack Kramer, who championed their cause, made his pro debut against Bobby Riggs at Madison Square Garden, more than 15,000 people showed up despite a snowstorm. Once they had won the majors and etched their names into history books, more and more players, like Laver and Rosewall, started looking at it as a means to a livelihood. It was an uncertain, unceremonious existence, but it paid the bills. At the same time, as the hardened pros had only each other to play and spar with, they got a lot better at their craft. In his memoir, My Story: A Champion’s Memoirs, Tilden wrote: “If tennis is to realise its full potential, it must find a solution to the pro-amateur problem plaguing it for so many years. Only through such a solution can there be free competition among not just a few of the great players of the world, but among all of them. The sporting public wants to see the best. It doesn’t give a hoot whether that best is amateur or professional." During Wimbledon 1966, BBC’s head of sport Bryan Cowgill and David, chairman of the All England Club, met Kramer to explore the possibility of bringing the best of pro talent to the venue. They etched out the design of the Wimbledon World Lawn Tennis Professional Championships: a three-day event featuring eight professionals. Kramer, who went on to co-found the Association of Tennis Professionals (ATP) in 1972, was tasked with bringing the players while BBC funded the £16,500 (around Rs14 lakh now) prize money. The Wimbledon Pro, as the event came to be known, attracted over 30,000 fans. Its resounding success made it easier for the power brokers of British tennis to decide the future course. Though the international body, then called the International Lawn Tennis Federation (ILTF), was opposed to the idea, the British Lawn Tennis Association defiantly voted 295-5 in favour of Open tennis and the All England Lawn Tennis & Croquet Club (AELTC) declared the 1968 Wimbledon “open". The LTA (Lawn Tennis Association) had requested nine professional tournaments starting 1968, but was granted only four (Bournemouth, The Kent Championships at Beckenham, The London Championships at The Queen’s Club, and Wimbledon). “In the history of the game, there was nothing as important as that decision," said Kramer in the Spirit Of Wimbledon Part 2 documentary that aired on BBC 2 in 2012. Thus, in April 1968, Bournemouth, played on powdered shale, became the first tournament of the Open era. In the men’s draw, seven of the top eight seeds were professional. Many of the national associations were fed up of paying unreasonable amounts to players to make sure they stayed “amateur" and played the Davis Cup. Lamar Hunt showed just how lucrative the sport could be when he signed players—called the “Handsome Eight" (Dennis Ralston, John Newcombe, Tony Roche, Cliff Drysdale, Earl Buchholz, Nikki Pilić, Roger Taylor and Pierre Barthès)—for The World Championship Tennis (WCT) at the end of 1967 in New Orleans. The commercially successful WCT would go on to introduce concepts like the tie-breaker and coloured clothing. With pressure mounting on the ILTF, it approved 12 “open" tournaments, which included the majors, on 30 March 1968. The 1968 French Open became the first Grand Slam to welcome professionals, and was, somewhat symbolically, played against the backdrop of student riots and civilian unrest in Paris—what came to be known as the May protests. When Billie Jean King won the women’s singles (her second in a row), women’s doubles and mixed doubles titles in 1967 at Wimbledon, she was given a gift voucher of £45. She returned to Wimbledon a year later, not just to complete a hat-trick of singles titles but to compete for the winner’s cheque of £750. Wimbledon offered a total prize money of £26,150 in the first year of the Open Championships, with the men’s singles winner taking £2,000. Pay parity, a cause championed by King, was a battle for another time. In 2018, the total prize money has risen to £34 million, with the men’s and women’s singles winners set to earn £2.25 million each. “Nobody imagined the game would go so global, with sponsorship and marketing budgets set to expand and television and media becoming so dominant and key to the games’ success, but that is why Open tennis was so important," says Paul Hutchins, one of the “amateur" competitors at The 1968 Championships, on email. “The ‘pros’ were so much better than the amateurs, or certainly in my case, therefore I respected both sides of the divide. If an ‘amateur’ was good enough and proved he was capable of getting a contract to be a contracted professional, why not? In those days, the players were not the political masters but were in full support of the tennis politicians changing the scene and making tennis Open." India’s Jaidip Mukerjea, who lost in the opening round that year but reached the Wimbledon fourth round four times, recalls sharing the locker room with players like Laver and Rosewall, who would earlier play in their own insulated circle of greatness. “Before 1968, there were three kinds of players: amateurs, registered players (those who profit from the sport without making tennis a profession) and the pros," says Mukerjea on the phone from Kolkata. “The Indian players—myself, Ramanathan Krishnan and Premjit Lall—were in the second category. I had not played with the pros before and it was definitely an exciting time. It was an honour to be part of such a historic tournament. Open tennis went a long way in making tennis a lot more professional in approach." That year, the onus was on the acclaimed pros, to prove that they belonged in a world without divisions. While Laver and Rosewall spearheaded their challenge, the amateurs were represented by talents like Arthur Ashe and Mark Cox. The latter had caused a sensation in Britain when he became the first amateur to beat a pro (Gonzales), in April in Bournemouth. Cox, studying economics at the University of Cambridge, once again flew the amateur flag high at Wimbledon when he made the fourth round. He battled Laver, 29 at the time, bravely for a spot in the quarter-final, but eventually went down 7-9, 7-5, 6-2, 6-0. “I did have a good match against Laver. Though he, I believe, found lefties more difficult than right-handed (players), but once he really got going, he showed me how to really play the game," says Cox on email. “The 1968 Championships were a triumph for the club, which had worked so hard to remove the hypocrisy that had pertained in the game. It should be pointed out though, from a British players’ perspective, to play at Wimbledon was the ultimate achievement even before Open tennis. The country nearly always came to a standstill during the two weeks known as the Fortnight—the highlight of the summer sporting calendar." Overall, 11 pros fell to amateurs in the men’s singles that year. Ashe, who lost to Laver in the semi-finals, went the farthest. 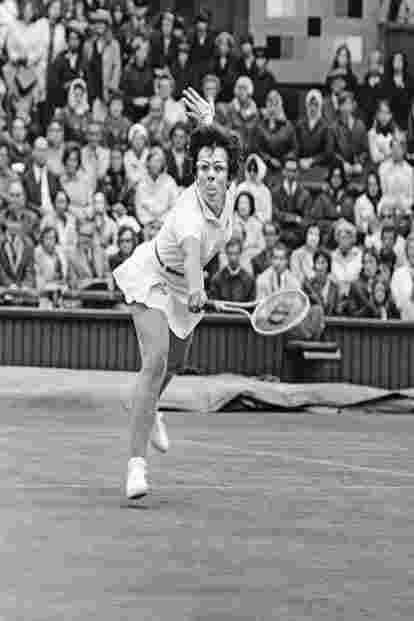 In the women’s section, King, who had turned pro in the spring of 1968, bagged her third successive title, beating Australia’s Judy Tergat in the final. She also went on to win the doubles title with fellow American Rosie Casals. Australian professionals Laver and Tony Roche contested the first Open men’s final at Wimbledon. While 15th seed Roche had surpassed expectations by making the summit clash, the left-handed Laver, with his quicksilver serve-and-volley tennis, was in a different league altogether. Five years after he had quit the stage, Laver claimed the Wimbledon title again with a 6-4, 6-3, 6-2 win over his fellow Australian on Sunday, 6 July 1968. “As I was handed the silverware after the match, I had a sense of déjà vu," Laver recalls in his autobiography. “Although I’d been in the professional wilderness for five years, in some ways I had never really been away." Open tennis meant he was here to stay—purple and green Wimbledon tie and all.